I love all the new fall flavors of yogurt available! Chobani also has a Pumpkin Twist that I unfortuantely couldn't find. I did try their Meze Dip in Smoked Onion Parmesan but the smoked flavor made it taste like meat so I couldn't eat it. Otherwise I imagine it could be a good sauce to put over pasta. Here's my review of everything I tried. Chobani Apple Crisp Twist - delicious, it's an apple cinnamon yogurt with pieces of spiced walnuts, cinnamon crunch & glazed pie crust pieces. The yogurt was pure white and tasted very authentic. And the pie crust pieces were an awesome add on. Chobani Pumpkin Blended - This tasted really authentic and delicious. Chobani Caramel Apple - I thought the caramel flavor was a little too smoky, there were a few small pieces of apple. I would just rate this ok.
Siggi's Pumpkin Spice - This had a very mild pumpkin flavor, it was more about the spices. 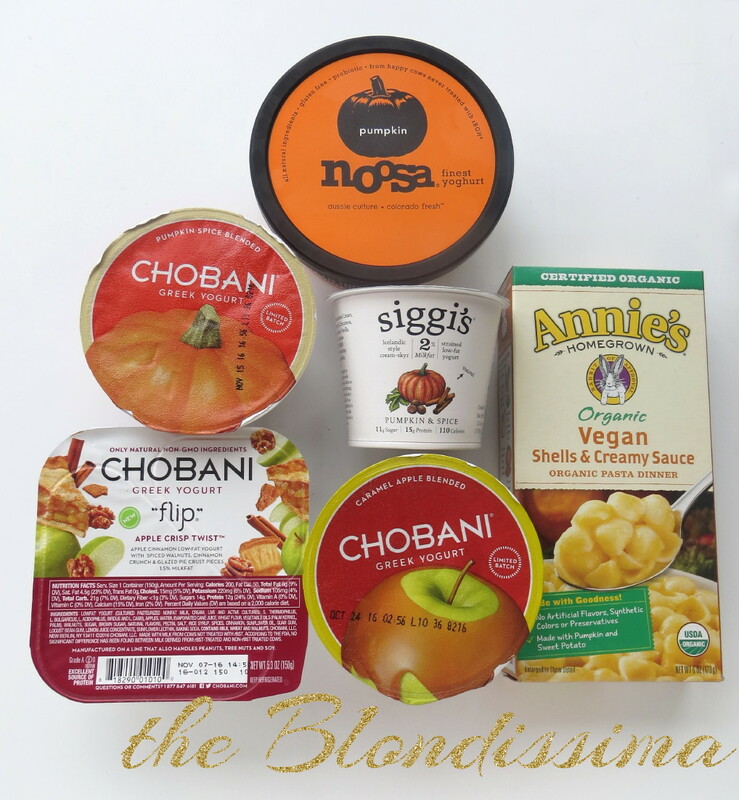 Noosa Pumpkin Yogurt - This seasonal yogurt used to be only available at Target, but now Whole Foods has it! Noosa is my favorite yogurt but it's high in calories and sugar so it's only an occasional treat for me. Noosa is an Aussie style yogurt which is similar to rich Greek yogurt. It’s made in Colorado from milk free of artificial growth hormones (rBGH) and artificial preservatives from outdoor cows that eat grain and alfalfa grown without pesticides. Eating organic yogurt free of artificial sugar (splenda) has always been really important to me. Their pumpkin flavor is absolutely divine, it was incredibly delicious!! I split the container into two servings so it’s better calorie wise. Definitely make sure to get your hands on one, you won’t regret it! Noosa also has some new flavors out, a whole line of yogurt with hot pepper in it, no thank you! But I do want to try the Mexican chocolate. Ok so I know this is a post just about yogurt, but I had to also throw in one other thing. Annie's Pasta in a pumpkin and sweet potat0 sauce - I was skeptical about this one, but it was surprisingly good. The directions say to use non-dairy milk but all I had was vanilla almond milk, thankfully the vanilla flavor was almost non-existent. I added some butter, peas and a little left-over pumpkin I had from a pumpkin I recently baked. Then sprinkled some cheese on top and it was delicious! I love yogurt, and love fall flavors (especially pumpkin!). I have some of that Chobani yogurt in my fridge right now, but have not tried it yet. I also want to look for the Chobani Apple Twist Crisp now. Thanks! Yum! I absolutely LOVE yogurt, and always look forward to the Fall flavor arrivals. The Noosa is to die for! We've been curious about these types of flavors and you just answered our questions. We will try them now. The Mac and Cheese sounds really tasty.